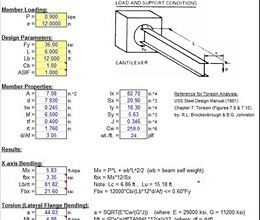 TORSION9 is a spreadsheet program written in MS-Excel for the purpose of simplified analysis and code checking of steel beams subjected to torsional loading. 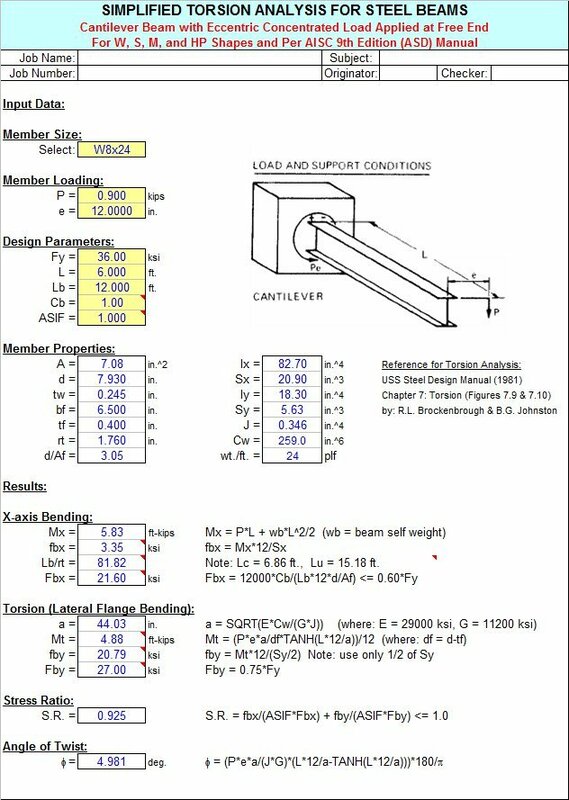 Specifically, six (6) different beam and loading configurations can be analyzed / code checked per the AISC 9th Edition Allowable Stress Design (ASD) Manual. Both actual and allowable stresses are computed, with the final result being a computed "stress ratio" of actual stress/allowable stress. Finally, the total angle of twist resulting from the torsional loading is determined. 2. This program is valid for AISC W, S, M, and HP shapes. 3. This program uses the database of member dimensions and section properties from the "AISC Shapes Database", Version 3.0 (2001) as well as the AISC 9th Edition (ASD) Manual (1989). 4. This program follows the procedures and guidelines of the AISC 9th Edition Allowable Stress (ASD) Manual (1989). 5. When the value of 'Lb' is input = 0 (or actually <= 1.0 ft.), this program will use a value = 1.0 ft.
6. This program utilizes an "Allowable Stress Increase Factor" (ASIF) which is a multiplier of any of the calculated allowable stresses Fa, Fbx, and Fby and also the Euler column buckling stresses F'ex and F'ey. It is used and appears ONLY in the stress ratio calculation. Typically a value of 1.0 may be used. However, a value of 1.333 may be used for load combinations which include wind or seismic loads. 7. This program does not calculate or check shear or deflection in member. 8. This program does not consider deduction for holes in members subjected to tension. * TORSION9 download link provides freeware version of the software. THERMAL is a spreadsheet program written in MS-Excel for the purpose of considering the thermal effects for a steel building or structure. TORSION9 has been rated 5.0 out of 5 points. A total of 6 votes cast and 0 users reviewed the software.